It's taken less than a year for the designer Philippe Knoops and his partner Caroline Descamps to establish their rugs and other exclusive creations on the other side of the Atlantic. These two Liège residents have since then been busy with their rapid export success. They immediately joined the network of Wallonia.be brand ambassadors, under the auspices of the Wallonia Export-Investment Agency. Thus, in early 2018, the first Moshi Moshi item was developed in their small workshop in Liège. Most of the products created by the double-M brand are 100% made in Wallonia and comply with a highly advanced specification. They are stamped with the Care & Fair label and certified as environmentally-friendly. Moshi Moshi works with selected manufacturers in India and Nepal that comply within international CSR (Corporate Social Responsibility) standards. The vegetable dyes are also special. Moshi Moshi, launched in early 2018 in Liège, creates rugs and other bespoke and exclusive decorative objects. It was founded by the designer Philippe Knoops and his partner in both life and business, Caroline Descamps, who works in communication & public relations. In just a few months, the double-M brand has received orders from the other side of the Atlantic. Negotiations are underway with European partners. 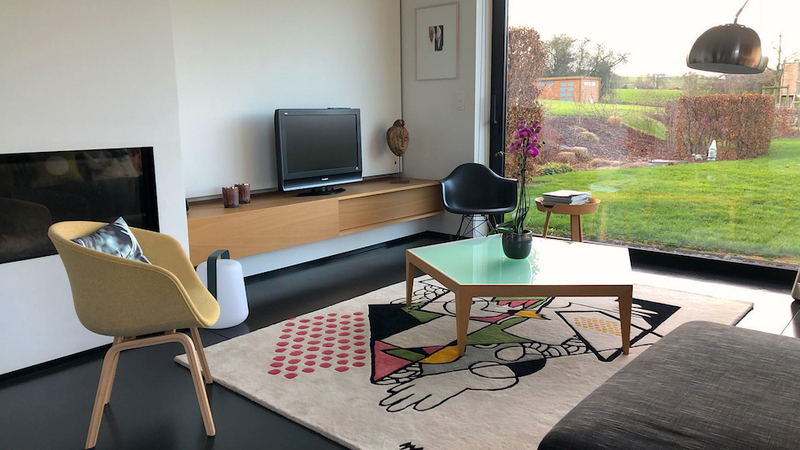 Moshi Moshi est un studio de Design de tapis et d'objets basé sur les hauteurs de Liège. Créés sur base d'une esquisse exclusive sur papier, réalisés à la main, noués, tissés ou tuftés, nos Tapis et Tapisseries murales se déclinent en pièces uniques sur mesure ou série limitée. Fusionner un savoir-faire authentique et une expression créatrice contemporaine pour offrir une gamme de tapis exclusive de qualité. Chez Moshi Moshi, nous faisons ce que nous aimons faire... et nous le faisons bien.